Ole Gunnar Solskjaer has released the shackles at Manchester United since taking over the reigns from Jose Mourinho. The Red Devils are knocking at the doors of the Top 4, and could still win the FA Cup or a surprise Champions League trophy. On Friday, the Reds made the trip to London to face Arsenal in the fourth round of the FA Cup. Solskjaer handed Romelu Lukaku and Alexis Sanchez with starts, giving Rashford and Martial necessary breaks ahead of the tight schedule. The Mancunians were at their best once again, as they ran out 3-1 winners to book a place in the next round. Sanchez and Lingard scored in quick succession, but Aubameyang managed to pull one back just before half-time. In the second half, Unai Emery’s men were piling on the pressure, as Bailly and Lindelof stood tall in the defence. But Anthony Martial came on in the 72nd minute and scored a goal within ten minutes to knock Arsenal out of the competition. Manchester United fans were elated with their team’s performance, but they were left amused by the Frenchman even before the game started. In the pre-match warm-up, Rashford made a mockery of Fred, as he nutmegged the Brazilian during a rondo session. 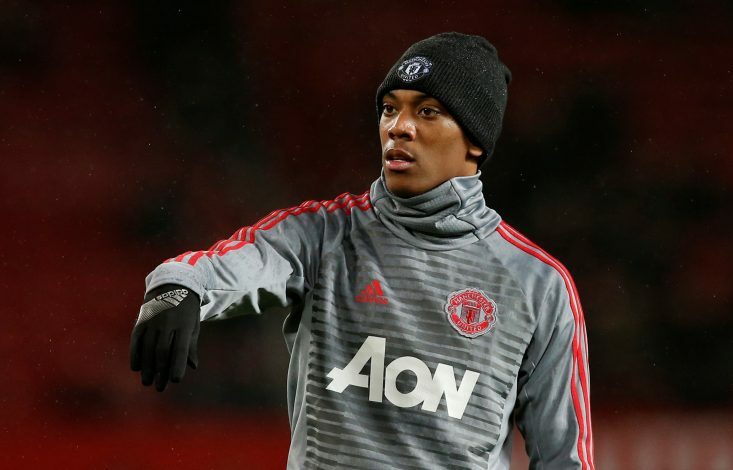 The substitutes ran towards the striker, except Martial, who instead ran away from the scene in disbelief.